When the Rudd Government announced its Human Rights Framework in response to the National Human Rights Consultation, I described it as a welcome though incomplete addition to protection of human rights in Australia. Many human rights activists have been very despairing about the government's response. I am more sanguine. Let me explain. Our report contained 31 recommendations, 17 of which did not relate to a Human Rights Act. We knew from the beginning that it would be a big ask for a Rudd style government to propose a Human Rights Act. After all, the Coalition was implacably opposed; the Government does not control the Senate; and the Labor Party is split on the issue with some of its old warhorses like Bob Carr being relentless in their condemnation of any enhanced judicial review of politicians. Even though most people who participated in the consultation wanted a Human Rights Act and, more to the point, even though the majority of Australians randomly and objectively polled and quizzed favoured an Act, no major political party in the country is yet willing to relinquish unreviewable power in the name of human rights protection. So the 14 recommendations relating only to a Human Rights Act were put to one side. This does not mean that the government has closed the door to further judicial review of legislation and policies contrary to human rights. In deciding not to open the door within a defined doorway (a Human Rights Act), the Government has just left the door swinging. How so? In accordance with our Recommendation 17, the Government is putting in place a rights framework which operates on the assumption that the human rights listed in the seven key international human rights instruments signed voluntarily by Australia (including the International Covenant on Economic, Social and Cultural Rights) will be protected and promoted. In accordance with Recommendations 6 and 7, Parliament will legislate to ensure that each new Bill introduced to Parliament, as well as delegated legislation subject to disallowance, is accompanied by a statement of compatibility attesting the extent to which it is compatible with the seven UN human rights treaties. Also Parliament will legislate to establish a parliamentary Joint Committee on Human Rights to scrutinise legislation for compliance with the UN instruments. So the Executive and the Legislature cannot escape the dialogue about legislation's compliance with UN human rights standards. Neither can the courts, because Parliament has already legislated that 'in the interpretation of a provision of an Act, if any material not forming part of the Act is capable of assisting in the ascertainment of the meaning of the provision, consideration may be given to that material'. Parliament has provided that 'the material that may be considered in the interpretation of a provision of an Act' includes 'any relevant report of a committee of the Parliament' as well as 'any relevant document that was laid before, or furnished to the members of, either House of the Parliament by a Minister before the time when the provision was enacted'. When interpreting new legislation impacting on human rights in the light of these relevant documents from the Executive and from the Parliament, the courts will assuredly follow the course articulated by Chief Justice Murray Gleeson in one of the more controversial refugee cases of the Howard era. So even though there be no Human Rights Act, the courts are now to be drawn into the dialogue with the Executive and the Parliament about the justifiable limits of all future Commonwealth legislation in the light of the international human rights obligations set down in the seven key UN instruments. That's not all. The Government's human rights framework notes that 'the Administrative Decisions (Judicial Review) Act 1977 enables a person aggrieved by most decisions made under federal laws to apply to a federal court for an order to review on various grounds, including that the decision maker failed to take into account a relevant consideration'. Retired Federal Court Judge Ron Merkel in his submission to our inquiry pointed out that the High Court has already 'recognised the existence of a requirement to treat Australia's international treaty obligations as relevant considerations and, absent statutory or executive indications to the contrary, administrative decision makers are expected to act conformably with Australia's international treaty obligations'. Ultimately Australia will require a Human Rights Act to set workable limits on how far ajar the door of human rights protection should be opened by the judges in dialogue with the politicians. We will have a few years now of the door flapping in the breeze as public servants decide how much content to put in the statements of compatibility; as parliamentarians decide how much public transparency to accord the new committee processes; and as judges feel their way interpreting all laws consistent with the parliament's intention that all laws be in harmony with Australia's international obligations, including the UN human rights instruments, unless expressly stated to the contrary. There is no turning back from the federal dialogue model of human rights protection. Frank Brennan chaired the National Human Rights Consultation Committee in 2009. On Tuesday 8 June he will address the roundtable being convened by the Australian Human Rights Commission and the Gilbert + Tobin Centre of Public Law to discuss the Australian Government's recently announced Human Rights Framework. This article was written for the newsletter of The Australia Institute and will appear there later this month. 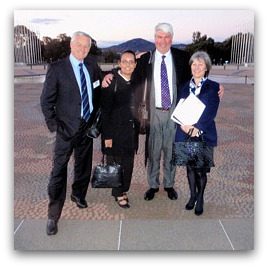 Pictured: The National Human Rights Consultation Committee, Mick Palmer, Tammy Williams, Frank Brennan and Mary Kostakidis at the conclusion of the public hearings in Parliament House, July 2009.
drawing on my memory of the words spoken by a judge on the occasion of his retirement many years ago, when speaking of a Bill of Rights he contended that a Schedule of Responsibilities should be an essential element of such a Bill! Not a bad idea I thought then - and think now. I agree with Fr Brennan that Bob Carr is implacably opposed to a Human Rights Act largely because of "enhanced judicial review of politicians" arising from such an Act. The same Bob Carr abolished civil juries in NSW that has certainly led to enhanced judicial review of individuals. Sounds like a jamboree for lawyers sucking up even more tax payers' money. Not only is there still no hint of a right to life, I suspect that, through this process, abortion will end up entrenched as a fundamental, unassailable human "right" which will cause even greater difficulties for doctors and other health care professionals who are not in the business of killing children in their mothers' wombs. Thanks, Frank, for what you've done for us all throughout the process just finished, and thanks for this reassuring piece as well. Yesterday’s Sydney Morning Herald reported that I believe that much of what the National Human Rights Consultation Committee proposed "will be adopted through the back door" (''Human rights by back door'', 7 June). To the contrary, I believe much of what we proposed, other than a Human Rights Act, will be achieved by the government's national human rights framework; and some of what we proposed through a Human Rights Act will be achieved by the courts rightly applying the legislation introduced to Parliament last week. Nothing back door about any of that. These are front door measures in which the executive, Parliament and the courts will play their distinctive roles transparently in the public domain, improving the protection of human rights. > "And still no hint of a right to life"
Oh, there'll be a right to life, all right, Peter, don't you worry about that. But it'll be used by the families of the Carl Williams types to sue police or soldiers for damages when their loved one is killed in a shootout. It certainly won't be invocable to protect unborn children from being aborted or harvested for our convenience. Well Frank, the refugee convention is still part of domestic law and we still ignore most of the provisions. Like legal rights, the rights to courts, not to be locked up and other teensy details. Plus the convention and protocol have been left out of the framework so no optimism from me about the cowards. Re Marilyn Shepherd's concern: The seven listed legal instruments provide for the setting up of international procedures for receiving periodic reports and supervising the actions of signatory states, and of optional procedures for the bringing of complaints. The Refugee Convention does not contain any similar provisions. It simply sets out standards which are to be embodied in states' domestic legislation and sets up the UNHCR which has no power to oversee the actions of signatory states with periodic review or complaints procedures. That's very true Frank but we wilfully break our own laws why would we bother now to listen to the very bodies that do protect those people under the refugee convention and covered by the 7 other committees? We ignore the other committees every time they report on us. Now we are happily breaching article 9(1) of the ICCPR with arbirarty and ilegal jailing of Afghans and Sri Lankans and the media are mostly silent. Marilyn, the Executive and the parliament will have to consider all future legislation for compliance with article 9(1) of the ICCPR. I would have thought that was better than the present position. The courts will then be in a position to interpret that legislation consistent with article 9(1) unless the legislation contain specific provision to the contrary. Is that not an advance? At least it is not a step backwards which in the present climate is saying something! I will believe it when and if I ever see it Frank. With men, women and children from Afghanistan and Sri Lanka currently in legal limbo in breach of Australian law and the so called people smugglers getting better treatment in prison and the right to lawyers, I have no such hope anymore in this disgusting country.